It is one in the morning and I'm up with my newborn. So why not wrap up a little blogging between feeding and bouncing, right? Today we have yet another frozen dessert and a particularly pretty one at that. 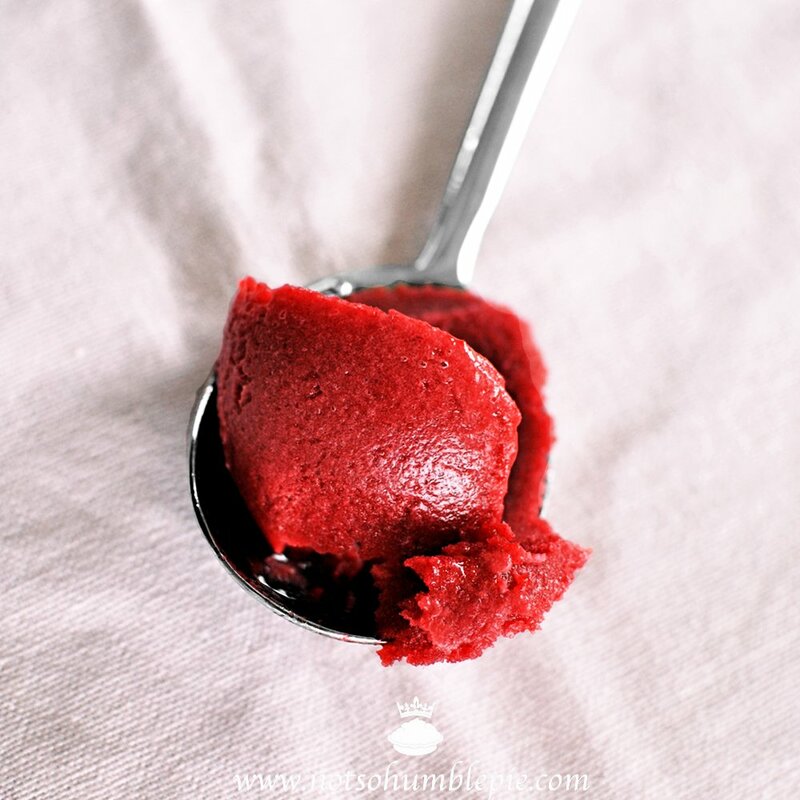 I absolutely love the combination of raspberry and rose, so a sorbet featuring those flavors seemed like a natural summer time choice for the blog. Gorgeous, isn't it? Such an vibrant red it almost makes me want to double check the settings on my camera. This dessert isn't just pretty to look at, it velvety smooth and packs bright fresh raspberry flavor and the sweet fragrance of rose. 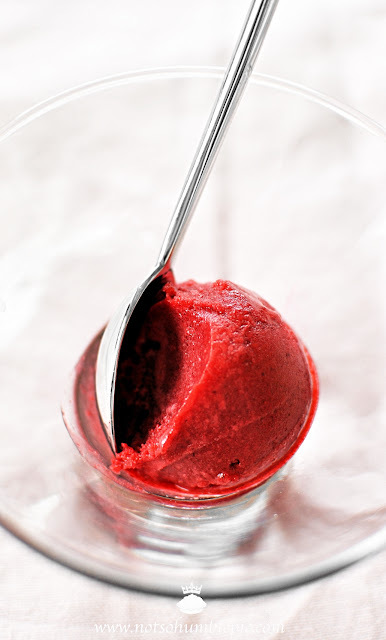 Sorbet is simple mixture of fruit and sugar, though you'll also see them made with booze on occasion (A spiced pinot noir sorbet graces the holiday menu around here once in a great while). However sometimes you see folks trying to divorce all or part of the sugar from their sorbet recipes as a means to make it healthier (What's that?!). While it would be great to make a sorbet packed with fresh fruit and only fresh fruit, such sorbets rarely turn out well. Flavor isn't a problem here, rather it is the texture where things tend to go wrong. You will often find that sorbets made with 100% fruit freeze solid or offer up a coarse, icy texture. This is due to the size of the ice crystals contained within. Those crystals determine the smoothness of texture in ice creams and sorbets. The smaller the crystals, the smoother the mouth feel. So to make a wonderfully velvety textured sorbet, we need to keep those crystals in check! This is managed primarily by lowering the freezing point. Dissolve just about anything in water and it will lower the freezing point (correct me if I am wrong here, chemists). Of course... there are limitations on what we might actually want to ingest. Polyethylene glycol for example, while edible, could make your dinner guests somewhat... resentful. Now sugar! Yes, sugar will do nicely. By using sugar, and plenty of it, your average home freezer will have a difficult time developing those big ice crystals and freezing the dessert solid. (It is worth noting that should you manage to find a nice pulpy fruit high in natural sugars you might be able to produce a 100% fruit sorbet and avoid adding sugar.) Of course, the drawback here is that the more sugar you use, the sweeter the sorbet and not everyone will enjoy a cloyingly sweet dessert. This is why I, despite my teetotaler habits, break out the booze when making sorbets. A small amount of alcohol will fulfill the same roll as sugar, when it comes to lowering the freezing point, without adding as much sweetness. This is also an opportunity to add a touch of flavor, since there are a myriad of flavorful boozes out there. Or not, in which case you can reach for plain ol' vodka. Now I understand not everyone will be comfortable serving up liqueur laced desserts to children or non-drinkers, no matter how teeny tiny the amount, so naturally you can consider this an optional ingredient. Sugar alone, in the right proportions, will go a long way towards producing the desired sorbet texture. There are other means of improving the texture too. Some add whipped egg white to their sorbets, and this helps incorporate some volume and improve the texture during churning--if your home ice cream maker is capable of beating in air, which sadly most are not. Air also limits the size of crystal formation and keeps things soft. However this isn't one of my preferred method, since sorbets made with eggs whites always seem a little 'off' to me. Then there are the other additives that I won't mention: stabilizers, gums, gelatin, etc that improve the texture but I tend to leave those to the commercial sorbet makers. Alright, I think we're ready to make some sorbet! Thoroughly blend the raspberries (I'm using frozen) and the water in your food processor (a blender will work too). Strain the berries to remove the seeds, pressing firmly against the berries to extract every last drop of juice from the pulp. This will be messy and require some patience. If you're working with frozen berries, as I am today, you should be able to add the mixture to your ice cream maker now. Otherwise cover the mixture and transfer to the refrigerator to chill. Once the mixture is very cold you can churn according to your ice cream makers instructions. Freshly churned sorbet, ready to freeze. When finished, transfer the sorbet to your freezing container, seal and chill until firm. you sound so "together"…baby, bouncing & beautiful recipe…all in the wee hours of the A.M.! stunning photographs & since the temp will be over 100 today…this looks very inviting! Could you make the sorbet with the seeds in? Other than smoothness is there any other reason to remove them? Yes you can leave the seeds in if you so choose. Other than the smoothness there is no reason to remove them. I often leave blackberry and raspberry seeds in ice creams, but in sorbets I tend to remove them since the volume of seeds can be rather high. Wow, if you can be up with a newborn at 1am and blogging so cheerfully, you are doing well. I was just continually shattered at that stage. I have wanted to get an ice-cream maker for soooo long, and now you've provided another reason why I MUST have one. This recipe looks fantastic! Do you think it would translate to making homemade frozen pops instead of sorbet? I don't have an ice cream maker, but I was thinking of getting frozen pop molds. Yup, one can absolutely make raspberry rose popsicles. I would reduce the sugar to one tablespoon per each cup of raspberries and use the minimum of water needed to make it fluid. The recipe sounds marvelous, the photos are mouth-watering, and the blogging between feeding and bouncing the newborn is mind-boggling. Thanks for the post (if ever there were a time, when I wished that the internet were really a "worm hole" through time and space, this one and one of your lemon curd pie posts were it!). Yum...it looks so RED. (My favorite color) I wonder if really ripe peaches would work with little-to-no sugar. Or watermelon? Althought watermelon seems like all you'd have to do is freeze it whole, no pureeing required, for a delicious dessert. Made this yesterday, but only had frozen mixed berries (raspberries, blackberries, and blueberries). It turned out great and tasted delicious! The color was almost eggplant. Thanks for the recipe. Peaches would be better than watermelon, pulpy and sweet. Watermelon though... so much liquid! I usually treat melon slices to a rest on paper towels overnight in the refrigerator to get a handle on all that excess liquid before making sorbet. And that's for melons like musk, which have a lower water content to begin with. A watermelon sorbet would be pretty icy, if you care about texture. However, watermelon would make a great granita! This sorbet is utterly delicious. Just the right balance of sweet and tart, everyone from my picky 10 year old brother to my lemonhead self loved it! what if you simmered watermelon puree with sugar to make a syrup/concentrate prior to freezing? Possibly. It would depend on how the flavor of watermelon handles heat --some fruits, like the delicately flavored lychee will evaporate along with the water--and how much sugar you can reasonably add to such a sweet fruit. Always worth a shot, after all probably the worst thing that can happen with a watermelon sorbet is an icy texture and that really isn't so bad.